Body pillows are considered by some to be a product that is wanted but not needed. But as the evidence showing the importance of sleep and its impact on our daily lives mounts, people have begun to realize that body pillows can serve an important role in achieving a good night’s sleep, which is definitely a necessity rather than a luxury. As a manufacturer of foam products, The Foam Factory has the materials and resources to create custom body pillows to help you get your best night’s sleep. Foam body pillows are intended to provide the support of many pillows in a single flexible, huggable form that stays with you throughout the night. Side sleepers can especially benefit from a body pillow because they help reduce the stress and pressure placed on the shoulders, back, hips and knees created when they aren’t supported. Even individuals who don’t experience aches or discomfort from sleep enjoy body pillows, as they simply find their oversize cushioning to be the most comfortable way to sleep. In addition to alleviating some aches and pains for every day users, body pillows for pregnant women are often recommended by physicians to help them with balance and support while sleeping. Full-body pillows provide many health benefits, including reduced stress on the body and improved circulation. While sleeping on their sides, many people’s knees and hips sag, stressing their joints and back. Body pillows can go between the legs and knees and boost the upper body at the same time, putting you in a more natural, comfortable position. That body support makes for a more natural position, reducing pressure points and helping circulation. Some people attempt to simulate this effect with standard pillows, but they often fall away during sleep. Body pillows however, are resilient forms that can support and align all the problem areas of the body simultaneously, with size that helps them stay where they’re needed. 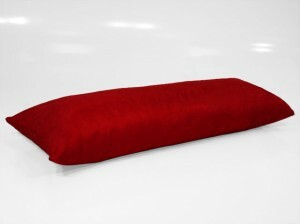 The Foam Factory’s body pillows carry many customization options for tailoring a cushion to your exact needs, with choices for size, foam filling and covering fabric. Beginning at their two fully-stuffed standard sizes, 22 inches by 60 inches and 16 inches by 60 inches, these are excellent forms for people who have never tried a body pillow before or don’t require specific dimensions. 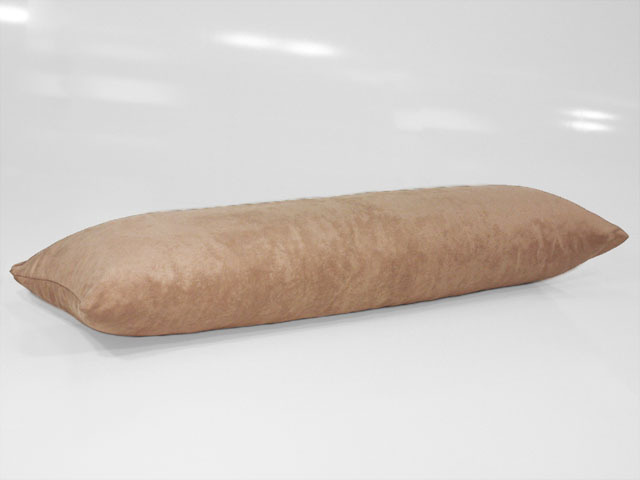 For those looking for a long pillow tailored to their individual needs, The Foam Factory also has the capability to produce custom pillow sizes; longer or shorter, thin, wide and even tapered. Along with custom sizes, The Foam Factory offers options for pillow stuffing for creating the perfect feel in your pillow. Conventional shredded foam provides resilient, body-forming support that will return to shape and size night after night. Shredded memory foam pillows provide luxurious, temperature sensitive support that hugs the contours of your body as you shift in your sleep. Along with the foam filling, shredded polyester fiberfill is also an option for creating a super-soft feel in a body cushion. Fiberfill is perfect for those desiring extra comfort with less need for body support. A unique benefit of the fiberfill body pillow is that the entire product is able to be laundered, as opposed to just the covers with foam-filled pillows. It is those covers that provide an additional dimension of customization for The Foam Factory’s body pillows. With options ranging from color and material type to whether they are removable or not, once you’ve selected a pillow that feels perfect, The Foam Factory makes it just as easy to ensure that it looks perfect as well. The simplest covering option is a gray and white striped, non-removable, 50/50 cotton and polyester blend. This ticking fabric is durable at an economical price. In nine vibrant colors, the cozy, 100 percent cotton twill covers can either feature a zipper for easy removal or be sewn completely shut. Available in 12 colors, the 100 percent micro-fiber suede covers have the same zipper or closed hem options in a luxurious, attractive fabric. Even black vinyl is available for maximum durability, with the same finishing choices; either zippered or hemmed. To prevent accidentally being scratched or poked by the zippers, they are encased in welting. For those who desire a removable cover, even more customization options are available. A black, fully sewn twill liner can be added to contain the pillow filling for easily washing the outer cover, or it can open directly to the interior filling contents if you anticipate adding or removing foam in the future. Whether thinking about purchasing a body pillow to help get through a pregnancy, reduce aches and pains from sleep or simply because you find it the most comfortable way to sleep, let The Foam Factory help you create the pillow that’s best for you and your life.